Retallack has an extensive show record, having won many major awards over the last 50 years. They have also won numerous fleece competitions. At Retallack we believe the showring is your shop front window. Reserve junior champion ewe and reserve grand champion ewe held by held by Isabella Grinter. Reserve junior champion ram and reserve grand champion ram (Retallack 420.15) held by Graham Grinter. Pictured also is their grandson Callum. 1st R.P. Harper Award - Ram Under 1yr. Supreme Australian Long Wool Exhibit - Retallack "Earthquake"
Interbreed Exhibit - Retallack "Tears I Cry"
CHAMPION RAM & SUPREME BORDER LEICESTER. BY "IMA CALLUM" (TWIN) . CHAMPION EWE AND SUPREME LONGWOOL INTERBREED EWE. RETALLACK "DOUBLE DIPPER" WAS ALSO AWARDED SIMILAR RIBBONS AT THE 2013 ROYAL CANBERRA SHOW. CHAMPION BRITISH BREED GROUP(MILK TOOTH) 1 RAM & 2 EWES. Both the ram and the ewe were part of the supreme group of the show. 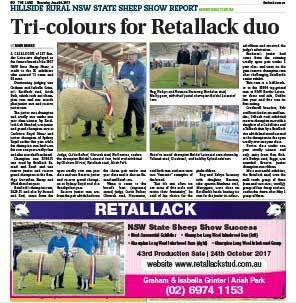 Retallack was awarded the "most successful exhibitor" with a team of 17 rams and 17 ewes. This class is judged on muscle depth, fat depth, growth & breed type.